A postmodern bohemian pad in Mid-levels, Hong Kong. Simple austerity with high impact. 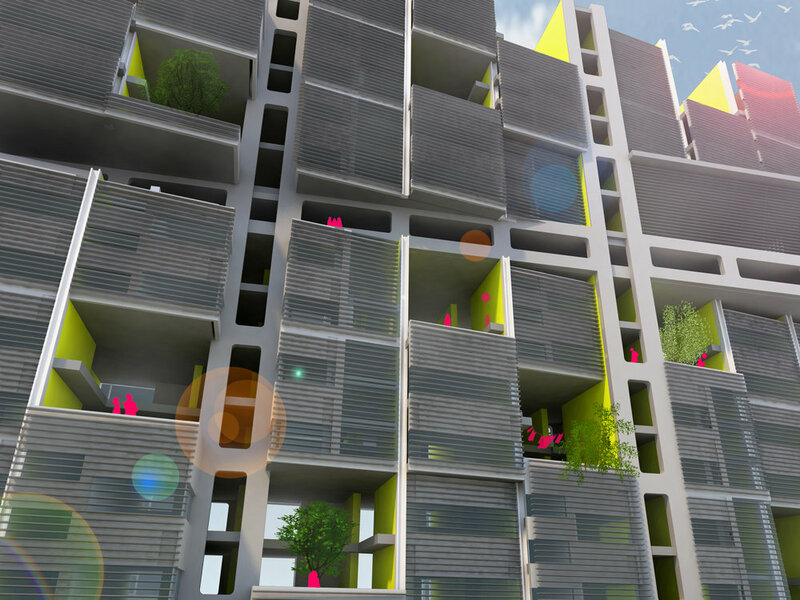 A reinvention of the Mat Building into a vertical slab with shared communal spaces. A contemporary twist on the classic Hong Kong-style diner. 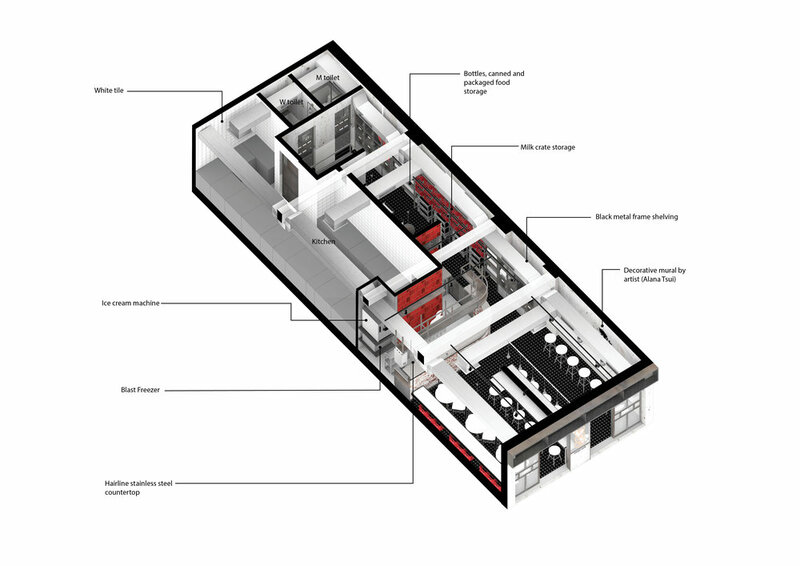 A campus within a building with a maximum possible floor plate. 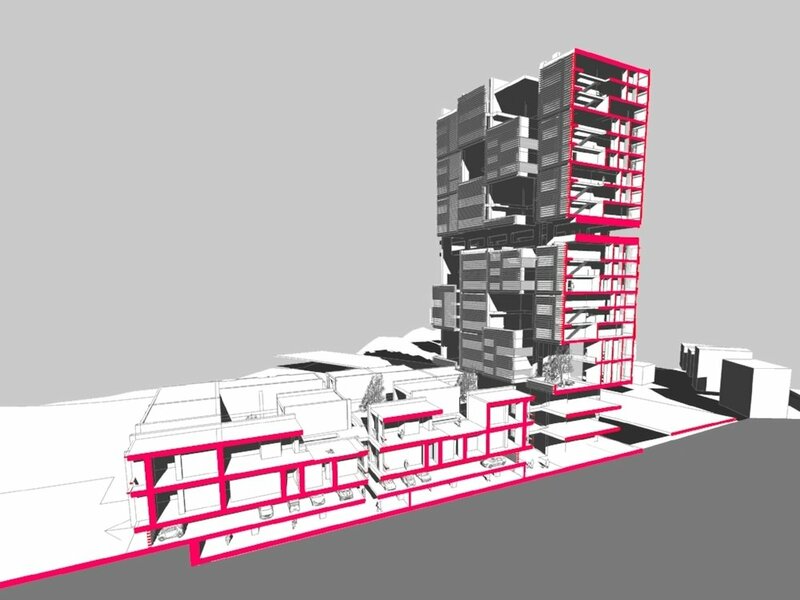 Vertical campus with a maximum triangular floor plate. Design for one of Korea's most prestigious department stores. Upgrade of 7 pairs of retail toilets within the premium Landmark portfolio. Lobby renovation of a prestigious Grade A office building in Central, Hong Kong. A postmodern bohemian pad in Mid-levels, Hong Kong, designed to be a retreat from the city. A plant haven with eclectic styling, it is a combination of minimalist design, vintage furniture and both natural materials and textures. Located within a landmark tower in Shekou, Shenzhen, the inspiration for the Danen Capital office interior comes from the clean, minimal lines of Scandinavian design. A rectangular grid of expanded metal mesh panels creates a simple yet sophisticated ceiling with varying transparency depending on the distance from the viewer. Features include an all-glass conference room, a geometric reception desk that welcomes visitors and a playful arrangement of light fixtures that offer a sense of light-heartedness. Cross Café is located in the upbeat neighbourhood of San Ying Pun, Hong Kong. It was commissioned by The Lark Group and uses the Trappist Dairy brand as a theme for the restaurant. Inspiration for the design came from Hong Kong’s ‘Bing Sutts’ (冰室), which are traditional cafes that were prominent in the 50s and 60s. They are unmistakable products of Hong Kong’s past, where Western menus have been localized and made affordable, fast and delicious. However, with rapid commercialization and urban renewal in the city, ‘Bing Sutts’ are fast disappearing along with the culture and memories that locals associate with them. We strongly believe that ‘Bing Sutts’ should be preserved and should continue to evolve with the ever-changing landscapes of the city and the tastes of its people. Studio UNIT started by giving the concept of ‘Bing Sutt’ a twist by extracting its fundamental characteristics and mixing these elements with the industrial rawness of metal, concrete, stainless steel and painted brick. 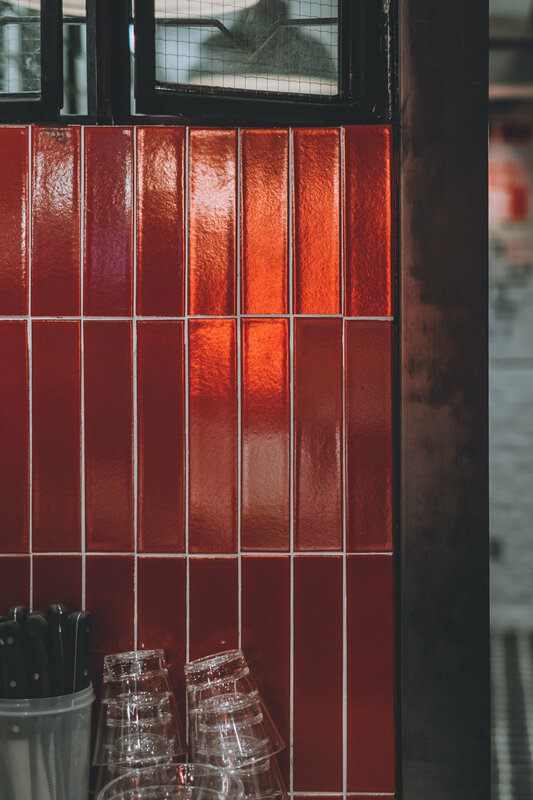 The color theme - white, red, and black, came from the original design of the milk bottle and challenges traditional colors found in the old cafes. These simple colors also reflect the pureness of dairy. Drawing ideas from the atmospheric Hong Kong depicted in director Wong Kar Wai’s films, we created moments that intend to immerse users within the same cinematic scenes. Elements such as classic window frames, translucent wire glass, calligraphic menus and mosaic floor tiles come from traditional ‘Bing Sutts’. 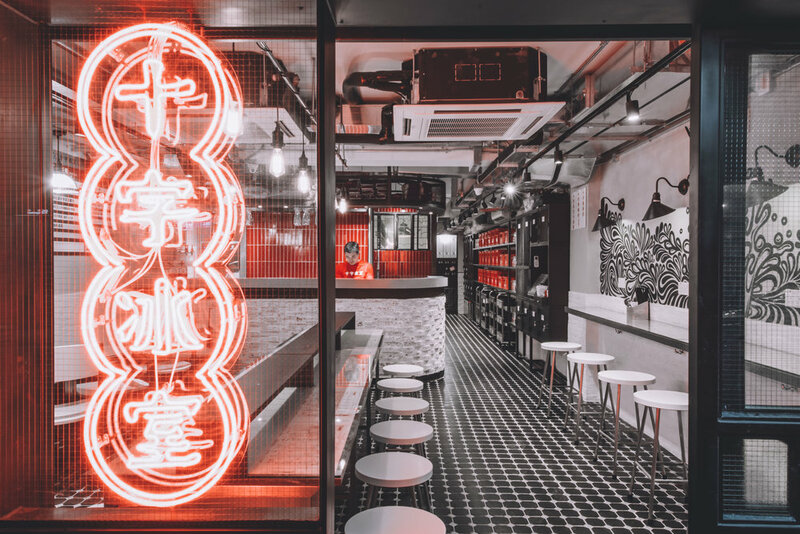 Metal gates and wall advertisements evoke the gritty backstreets of 60’s Hong Kong, and a neon sign washes the interior with a subtle orange glow, offering an ambience reminiscent of Hong Kong’s fast disappearing, neon infused street scenes. All the above is presented within the simple black, white and red color palette, giving these recognizable elements a stylish interpretation. 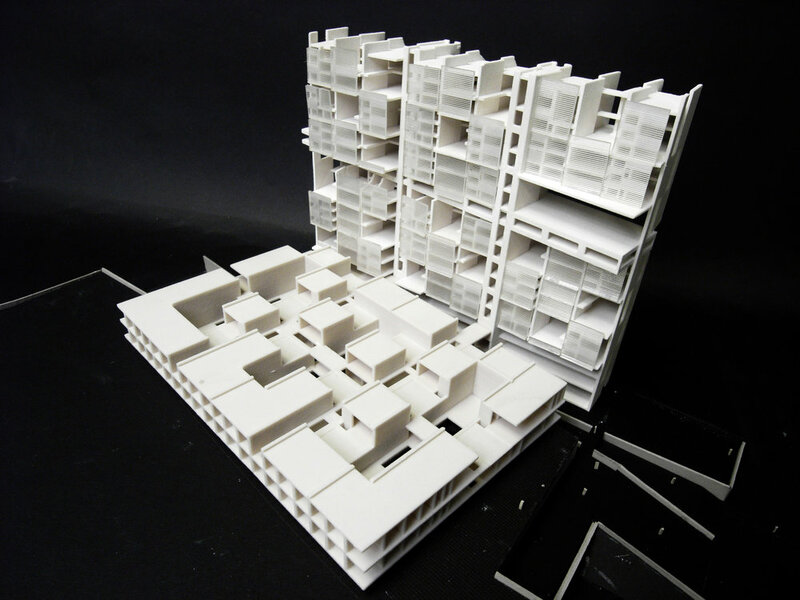 This project attempts to retain the qualities of the mat-building, but reinterprets it in the form of a skyscraper. The vertical mat-building takes advantage of the skyscraper’s land-efficiency as well as increased surface exposure to sunlight and ventilation, but challenges the popular notion of skyscrapers as creators of ‘planes of isolation’. Advantages for sun, wind and light associated with skyscraper have been exploited and livelihood is sustained by a mix of programs from recreation to commercial found at ground level and within ‘pockets’ of shared spaces around the vertical mat-building. The vertical mat-building is a modular hierarchical system with the dwelling unit as the basic aggregate. 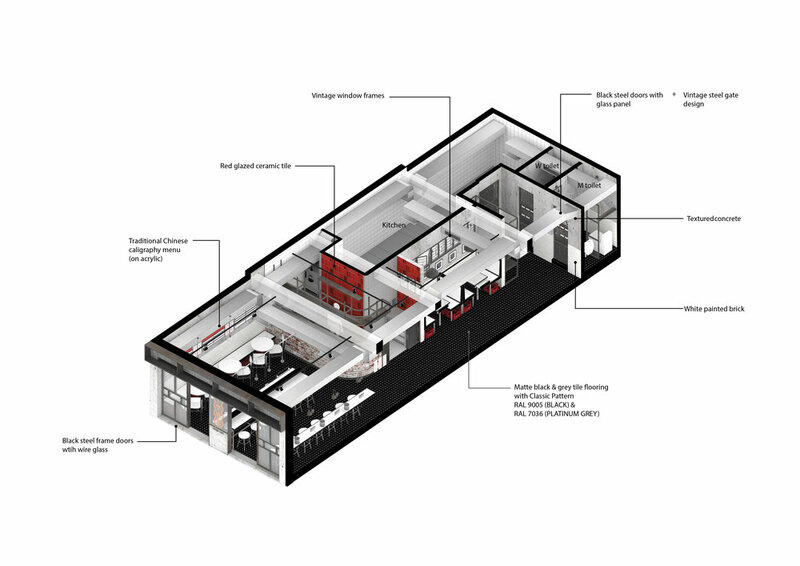 A double-height communal courtyard linked to shared facilities such as an open terrace act as part of a circulation system which provide accessibility to each unit. 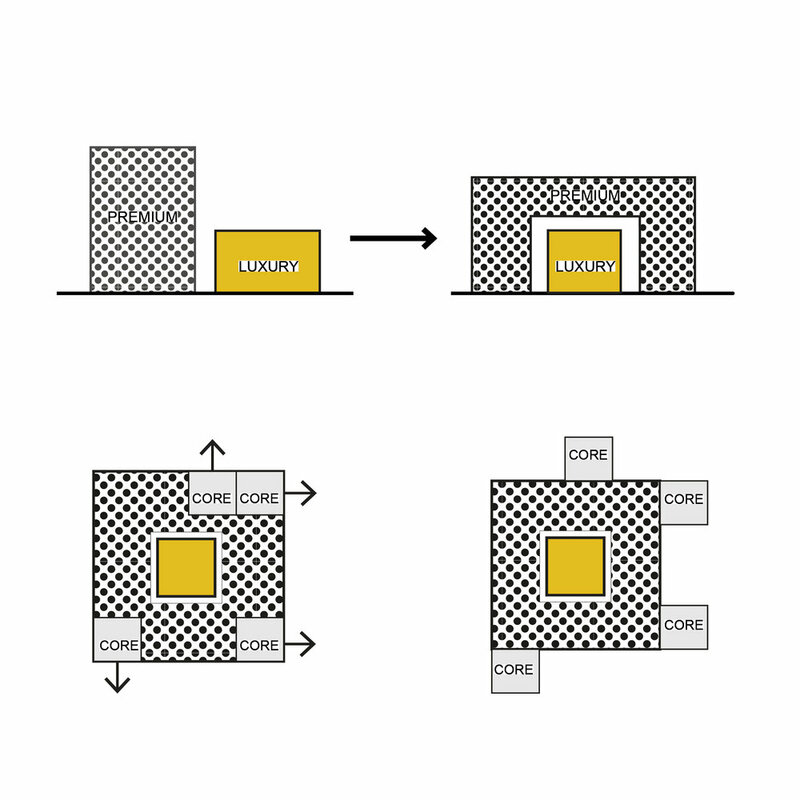 Three ‘neighborhoods’ are aggregated into ‘quarters’, and six quarters constitute the miniature ‘city’ which is the vertical mat-building. 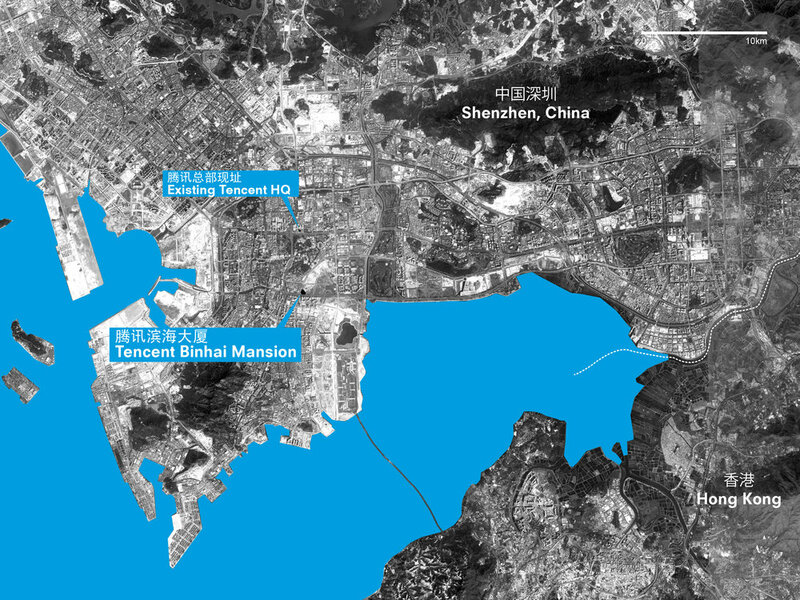 While Tencent’s online products provide virtual interaction, the consolidation of all staff within the same building is crucial for internal communication and creative interaction. Having one single volume provides maximum flexibility for the arrangement of offices as well as efficient mobility for staff. 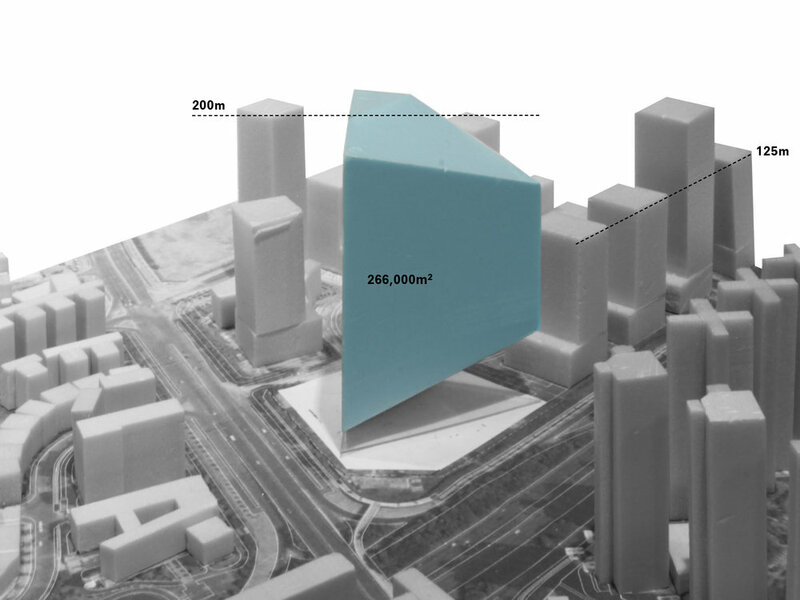 The largest floor plate achievable within the constraints of the site is 180m x 180m, and it is inevitably square in shape. To reduce the overall bulk of the massing, corner cuts were introduced to define entrances and to give a lighter appearance to the building. A roof setback further increases the slenderness of the elevations while providing a panoramic rooftop terrace with an unobstructed loop for outdoor activities. To supply the expansive floor plate with sufficient light and air, triangular courtyards are excavated with natural landscape to provide interest to the interior. A triangular, multi-faceted tower was placed on an irregular site to stand out amongst the dynamism of Shenzhen. Its shape changes from different angles of perception and directions of approach. Cuts are sliced off from the base and top to create an entrance and terraced offices at the roof, creating a sophisticated, sculptural tower that reflects the single yet variegated identity of Tencent. On the interior, the large triangular floor plate breaks the uniformity of typical office plans and offer a wide range of spatial encounters. Experiences created from conditions of light, scale, openness as well as intimacy makes for endless variations that accommodate Tencent’s ever-changing needs. The subtle gradation of the fritted glass façade is an expression of the triangular megastructure and gives an illusion of depth, further enhancing the tower’s effect as a dynamic object. The Hanhwa Galleria department stores are the most prestigious of its kind in Korea, and are known for their innovative combination of luxury shopping and art and design. 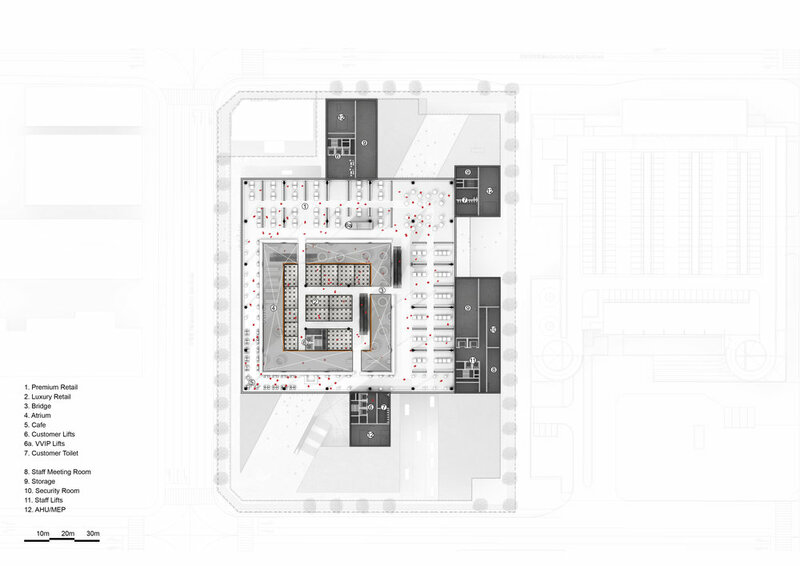 Famous worldwide for their premium and VVIP shopping experience, OMA has taken this further by integrating the luxury department into the core of the building, where VVIPs ascend in full privacy into the heart of retail. The luxury cube, or “gem”, becomes the central focus and visual register of the Busan Galleria shopping experience. 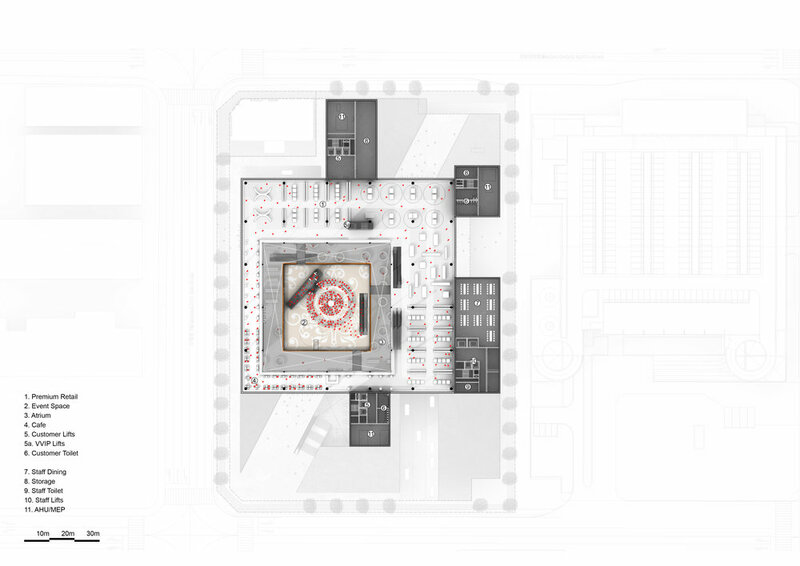 Back of house areas and mechanical cores are shifted to the exterior periphery to maximize uninterrupted shopping spaces that revolve around the luxury “gem”. The objective was to unify the Landmark shopping experience by introducing the quality of luxury hotel toilets into retail toilets. The design aims to materialize the Landmark branding strategy: Modern, Luxurious and Timeless. A total of 7 pairs of toilets were upgraded across the Landmark portfolio. This renovation of a Class A office lobby in one of Hong Kong’s prime locations aims to build on the classic austerity of the existing lobby, but enhances its lighting and spatial qualities. The main feature ceiling is to be reclad in a light wood finish while pristine white marble will replace the existing granite floor. Lighting schematics are completely redesigned with high power LED fixtures to provide drastically improved illumination levels. The uplifting palette together with re-planning of the Chater Road entrance to include a light refreshment café, the installation of high definition video walls, and the design of minimal yet distinctive concierge desks define a lobby suitable for world class tenants.